Update: Shoreside Chic is now called Boheme Chic. Whenever MP is asked what she’d like for a special occasion, the answer, without fail, is jewelry from Shoreside Chic. Portland-based jewelry designer, Kate Clark, makes simple but beautiful pieces inspired by vintage and nautical designs. You’ll find everything from bold statement necklaces to classic earrings and bracelets you can wear everyday. Kate’s Haberdashery Collection features this vintage, lucite link necklace. Love. 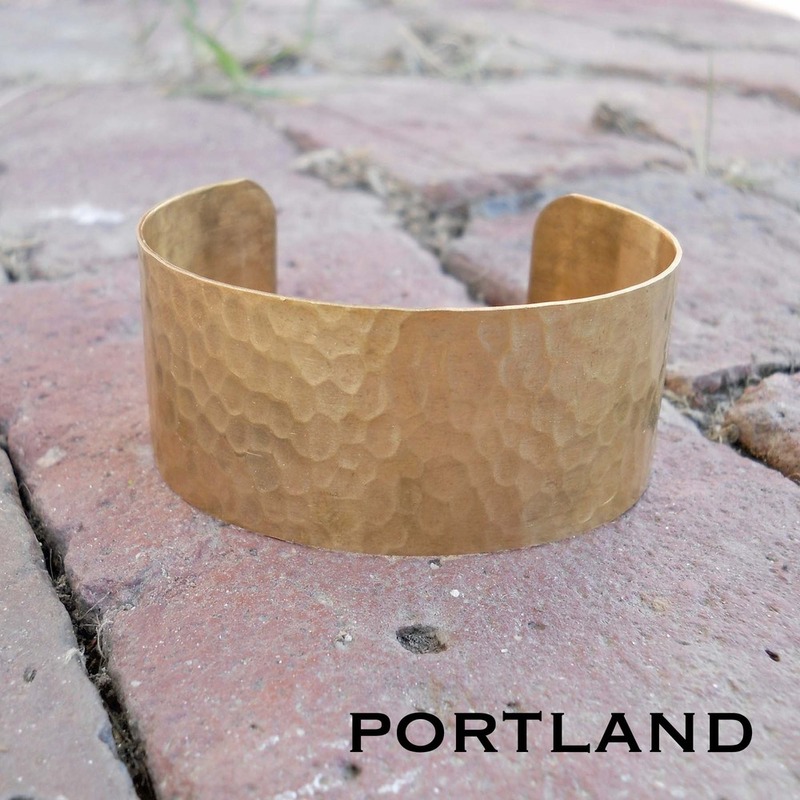 A vintage, hammered cuff from Kate’s Portland collection. Comment on Cute Potato to enter. Thanks, Dana! just in case it’s here… love the sailor knot necklace! Thanks! No idea why it defaulted to an old screen name…but “brokemaine” is also me! The fishing ball pendant is gorgeous! I love it all!! If I was forced to pick just one it would have to be the hammered gold cuff. So great!! I hope to see that cute little trailer roaming around Maine this summer! Oh, and I hope to win!! I love the Forget-Me-Not wire ring! I can’t decide the two – but I have the anchor seaglass pendant and the leaf filigree earrings. Such a beautiful stuff. Thanks for doing the giveaway! I love the hammered gold cuff! The Vintage Hammered Cuff is lovely. In love with the Wanderlust Beaded Hoop Earrings! Think I’d choose them on emerald… Beautiful! I like the lace earrings. LOVE the anchor seaglass necklace! Love the Bauble Rope Necklace! thanks for sharing! Wow! Love it all, but the Mod Ball necklace definitely caught my eye! Thanks for sharing her site. I am a Casco Bay, Maine (female) sailor. I absolutely love all of her creative nautical pieces. I do not own a piece of jewelry that expresses my love of the ocean, sailing, surprisingly so since my husband is a captain. To win a piece of her jewelry would be a delight. I love the idea of her little camper store and hope to see it in the Old Port this summer. So. much. prettiness. If I had to choose one, it would be the Beach Sand Earrings from the coast of Maine in Silver. 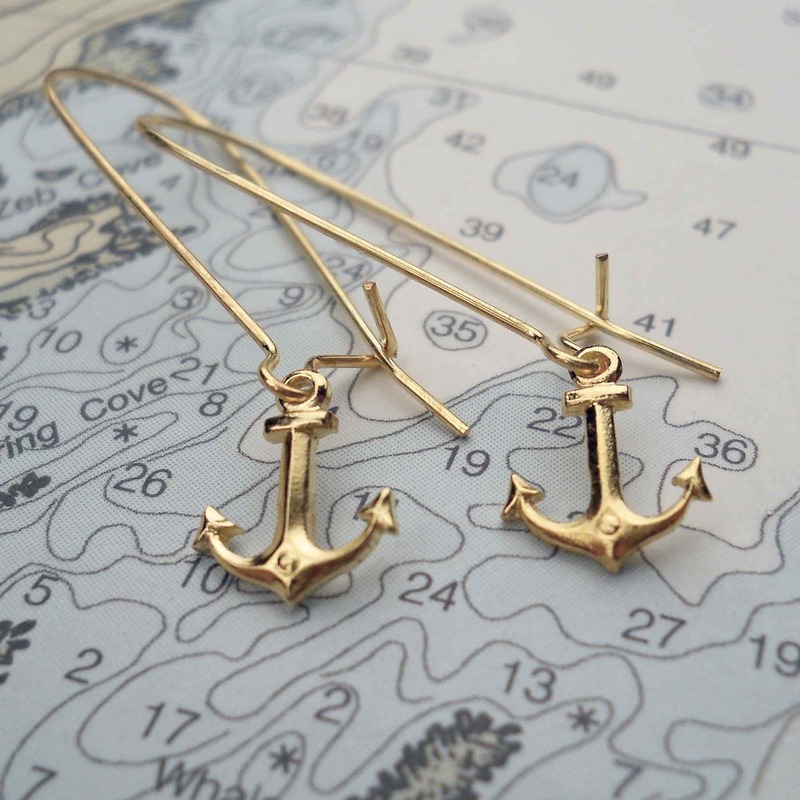 on May 3, 2013 at 8:44 am | Reply Catherine B.
I am in desperate need of earings…..those cute anchor earing are darling! It’s beyond time to have a state of Maine outline necklace but the filigree leaf earings are just beautiful. Whale tail necklace! so cool. Love her jewelry! The anchor sea glass pendant is my favorite! on May 3, 2013 at 7:15 pm | Reply Morrigan B. All of her things are beautiful! I love the silver beach sand earrings- what a neat idea! I would love the freshwater pearl necklace! But I also love it all! Oh, such beautiful things…I think I would choose the Sea Glass Ring…unique. Thanks for the chance to win. I love the white and gold anchor pendant! What a cute site! I would choose the Beach Sand Earrings from the coast of Maine in Silver! Forget me not wire ring! Forget me not wire ring for sure! Cute jewels! The lucite link necklace hands down. My three year old son is obsessed with my chunky necklaces…he’d love this one! Lol!